Fatter, fuller, grittier, tighter, dirtier Tele bridge sounds. Designed for darker, sleazier, more alternative playing. Initially designed for Jaguars guitars, they're now available for Telecasters too - Designed for players who wanted something darker, grittier, something more savage & physical from their guitars, but keeping a tight, razor focus to really cut through the band mix - Not a traditional rock, indie or blues sound, something much more aggressive & visceral. Essentially the idea was to design a raw, more primal sounding pickup to work with the existing Strat wiring for pure alternative sounds and styles of playing. Much tighter, much more focussed sounds than my Sonic '60s, these were designed specifically to play loud. A single plated steel blade sits at the heart of the design inside a much more tigter coil of thinner 43awg coil wire, and I experimented with a variety of magnet grades and sizes until finally working on a duo of custom manufactured square bar Alnico 5s. Available in a stark black or white open face design, the new Telecaster Dark Line pickup is a direct drop-in replacements, designed to turn that Fender or Squier Tele into a much more powerful guitar - I spent a long time getting the design of these just right, putting them aside, coming back to them - a real labour of love. 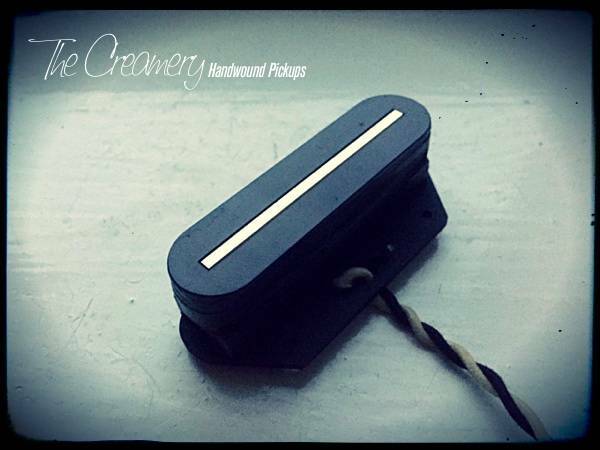 You can find more details of my Creamery Custom Shop Handwound Replacement Telecaster Pickups here.